Solid Solver - Roadrunner Rubber Corp. 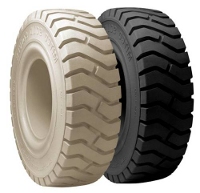 The SOLID SOLVER pneumatic shaped solid tire is a product made proudly in the USA in both standard black and non-marking white. This sturdy two-stage solid tire has an aggressive yet efficient tread design which wears longer and better than other common industrial tires. The SOLID SOLVER will give you longer hours and more stability. To view product details, please click here for the PDF brochure.